The seasonal allergy season is upon us. Use these top tips to beat allergy symptoms this season and get Dr. Ellie's custom Allergy-Ease Kit before they are gone! Allergies, seasonal or otherwise, is one of the biggest health issues people deal with in the United States. And the numbers are rising every year. Part of this is because our agricultural practices have changed drastically in the past 40 years and our bodies are not accustomed to dealing with genetically modified foods or the excessive amounts of pesticides now being put in and on our food. We are also being over-medicated with antibiotics used in livestock we eat and that we are prescribed by our own doctors. This has created superbugs like MRSA that no longer responding to antibiotics. Our immune systems just can’t keep up. So every year, the number of people experiencing allergies is increasing. But what if there were a way to combat seasonal allergies without the harsh side effects of medications and to actually get to the root of the problem instead of just masking the symptoms? There is a way to do this and it’s called acupuncture and specific herbal medicine to tackle seasonal allergies even before they start. At Starting Point Acupuncture in Bothell, WA, Dr. Ellie has seen that the rise in people suffering from not only seasonal allergies but food and environmental allergies. Every year people come in to the office saying “I have never had allergies before, why am I suffering?” We have also seen people are not responding to over-the-counter allergy medicine like they used to and are having worse and prolonged symptoms. Common allergy symptoms seen are: sinus congestion, ear pain or pressure, cough, headache, fatigue, runny nose, and sneezing. Do note that there are many different kind of allergies. Immediate and anaphylactic type allergies such as the peanut allergy example. But also there are a delayed-type allergic reactions. Where you could be exposed to an allergen on Monday but may not have symptoms until a day later. People can be allergic or sensitive to the foods they are eating, seasonal allergens in the air, or environmental allergies such as mold, fragrances, etc. It all comes down to proper gut health and immune support. Creating this “shield” and defense up against your bodies response to those allergies is key to tackling seasonal allergies. What can you do to tackle seasonal allergies? Acupuncture and Traditional Chinese Medicine offer a permanent solution to seasonal allergies and relief from everyday allergies with an all-natural approach that will ultimately save you money. Since TCM attacks allergies in a much different method than Western medicine, there is a good chance your allergies will cease to be a problem. Western medicine knows how allergies work and what happens to the body, but there is still no explanation as to why. But, TCM doesn’t need to know why because it looks at the body as a whole and uses an elemental system to determine where there are excesses and deficiencies in each person. So, the acupuncture treatments are completely customized to each patient, thus making them much more effective than one-size-fits-all over-the-counter medications. When using acupuncture and natural medicine to treat allergies, practitioners focus heavily on something called Wei Qi. Wei Qi is similar to the immune system in Western medicine. Wei Qi protects the body against foreign materials that can lead to inflammation and eventually allergies. People with lower immunity/Wei Qi are more susceptible to allergies and frequent colds. Acupuncture helps to boost the Wei Qi making it more difficult for allergens to attack the body. This is one of the best reasons to get regular acupuncture treatments if you suffer from allergies of any kind. Probably the biggest reason to seek out acupuncture for the treatment of allergies is the amount of money a person will save. People spend over $18 billion per year on over-the-counter allergy medications, most of which only give minimal relief and have side effects like drowsiness and immune system suppression. Acupuncture and specific supplementation can provide relief without adverse side effects and for a lot less money overall. 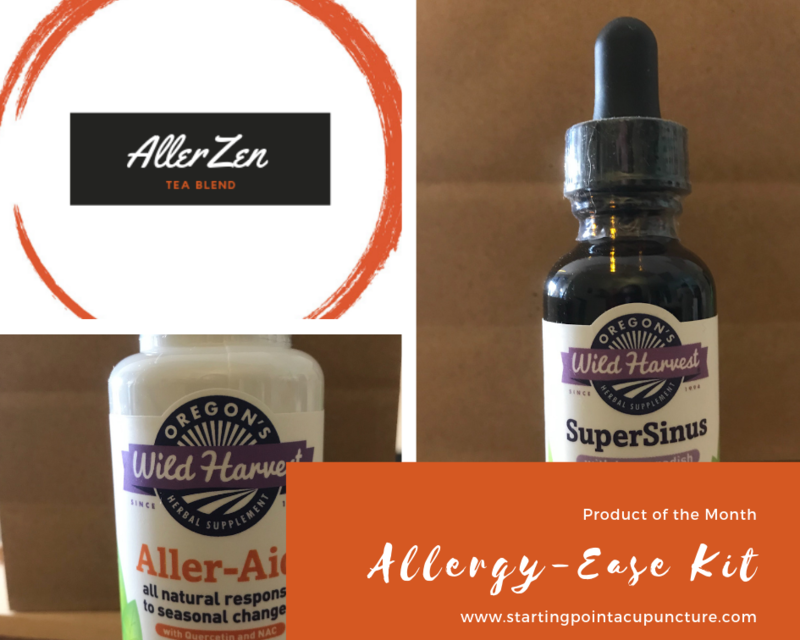 Dr. Ellie created this product bundle because having specific supplements on hand can help to support the acupuncture treatments and give your body the tools to tackle seasonal allergies. The kit includes Dr. Ellie’s custom AllerZen Tea blend, Aller-Aid + Quercitin supplement, and SuperSinus tincture. All to help naturally decrease the histamine response, boost immune function, and help you breathe with ease! To grab your Allergy-Ease Kit, get one at your next appointment or drop by the office. Get a jump start on your immune health and tackle seasonal allergies before they start! ← How does acupuncture help migraines?